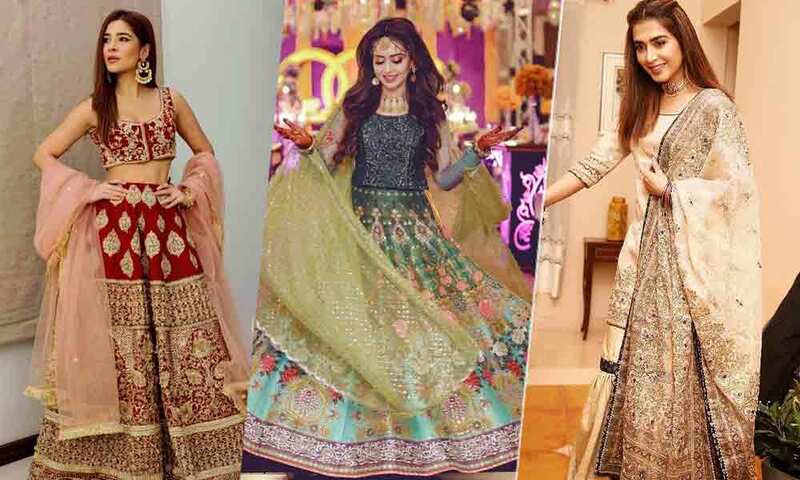 Home Lifestyle Fashion 7 Style Statements That You Can Rock At Weddings! 7 Style Statements That You Can Rock At Weddings! There is one season that stays all year round in Pakistan that is the “Wedding Season”. Every day, our social media announces to us the news of someone getting married and we’re sure to be invited to at least one wedding! However, one of the most stressful things about ‘shaadis’ is that you can never be sure about what to wear. Whether it’s your best friend’s wedding or some far relative uncle or aunty, it gets hard to decide what to wear. Apart from the wedding itself, there are a number of functions that has its own distinctive feel and requires the perfect outfit for it. Ayesha Omar looked absolutely stunning in Hussain Rehar’s lehnga choli. The ensemble was fully embroidered with gold zardozi work on red. While the dress was fit for a bride, it worked perfectly for the bridesmaid as well. Not everyone likes pastels and not everyone can pull them off. However, pastel colors are perfect for every occasion if they are carried the right way! This swirly pastel-colored lehnga by Misha Lakhani appears flamboyant and sassy with its subtle bead and sequin work. The gorgeous ensemble is bound to make anyone a head turner at a wedding event. 3. The one where you get to experiment with colors! Most Mehendi functions are more extravagant and colorful than the actual wedding. This is the perfect opportunity to play around with some colors. While, this Nomi Ansari’s mughal-esque creation may not be for everyone, but paired with a plain blingy blouse, it could look really gorgeous. 4. When you want to be the minimalist! White is that one color that doesn’t need much doing and you can make it look formal or flashy with the help of some accessories and suitable makeup! Mansha Pasha is totally rocking this minimalist look, perfect for an intimate Nikah event. Champagne, grey and nudes are all the rage these days! Paired with maroons, magenta or, hot pink the combination is a winner for every occasion. May Ali’s Anarkali ensemble by Nomi Ansari is one example of that. 6. When you want the Kameez Shalwar to do all the talking for you! Sometimes traditional Shalwar Kameez are all that requires a dress to look glamorous. Not only they are gorgeous and make a style statement, but also very comfortable to wear. You don’t have to worry much about tripping over your dress. Also, sometimes, less is more! 7. When in doubt, opt for a saree. Who doesn’t love a saree? There are so many variations of how you can drape one and how you can style yourself for the occasion. For this particular number, Mahira flaunted a powder pink Nomi Ansari saree with contemporary black embroidery. Looks chic and sophisticated to don at a Valima function. Which one of these looks do you like the best? Let us know in the comments below.